Professor Hajimiri's group does research on electronics and photonics integrated circuits and their applications in various disciplines, including high-frequency and high-speed communications, sensing, imaging, and bio-sensing. 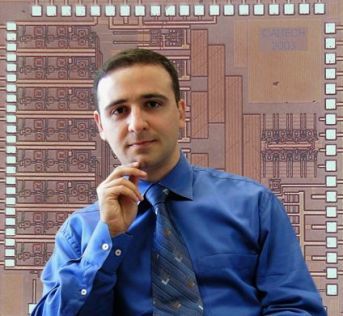 His research group engages in both the theoretical analysis of the problems in integrated circuits as well as practical implementations of new systems. He joined the Faculty of the California Institute of Technology, Pasadena, in 1998, where he is Thomas G. Myers Professor of Electrical Engineering and Director of Microelectronics Laboratory. His research interests are high-speed and high-frequency integrated circuits for applications in sensors, biomedical devices, photonics, and communication systems. Ali Hajimiri received the B.S. degree in Electronics Engineering from the Sharif University of Technology, and the M.S. and Ph.D. degrees in electrical engineering from the Stanford University. Prior to joining Caltech, he was with Philips Semiconductors, where he worked on a BiCMOS chipset for GSM and cellular units from 1993 to 1994. In 1995, he was with Sun Microsystems working on the UltraSPARC microprocessor's cache RAM design methodology. During the summer of 1997, he was with Lucent Technologies (Bell Labs), Murray Hill, NJ, where he investigated low-phase-noise integrated oscillators. Dr. Hajimiri is the author of The Design of Low Noise Oscillators, has authored and coauthored more than 150 refereed journal and conference technical articles, and has been granted more than 60 U.S. patents. He has been on the Technical Program Committee of the International Solid-State Circuits Conference (ISSCC), and has served as an Associate Editor of the IEEE Journal of Solid-State Circuits (JSSC), as an Associate Editor of IEEE Transactions on Circuits and Systems (TCAS): Part-II, a member of the Technical Program Committees of the International Conference on Computer Aided Design (ICCAD), Guest Editor of the IEEE Transactions on Microwave Theory and Techniques, and Guest Editorial Board of Transactions of Institute of Electronics, Information and Communication Engineers of Japan (IEICE). Dr. Hajimiri was selected to the TR35 top innovator's list (formerly TR100) in 2004. He is a Fellow of IEEE and has served as a Distinguished Lecturer of the IEEE Solid-State and Microwave Societies. He is the recipient of Caltech's Graduate Students Council Teaching and Mentoring award as well as the Associated Students of Caltech Undergraduate Excellence in Teaching Award. He was the Gold medal winner of the National Physics Competition and the Bronze Medal winner of the 21st International Physics Olympiad, Groningen, Netherlands. He was a co-recipient of the IEEE Journal of Solid-State Circuits Best Paper Award, the International Solid-State Circuits Conference (ISSCC) Jack Kilby Outstanding Paper Award, a co-recipient of RFIC best paper award, a two-time co-recipient of CICC best paper award, and a three-time winner of the IBM faculty partnership award as well as National Science Foundation CAREER award and Okawa Foundation award. In 2002, he co-founded Axiom Microdevices Inc., whose fully-integrated CMOS PA has shipped close to two hundred million units, and was acquired by Skyworks Inc. in 2009.